Take a deep breath. Close my eyes. Tighten my lips. Throw my head back in half surrender/half realization/half annoyance. Crrrrap. This is a lesson, isn’t it God? This is less about my children listening to my craziness and more about me listening to Your commands, isn’t it? I’ll save you the suspense. Yes, yes it is. It pretty much always is. This is about building our houses on the rock. It’s so funny how a simple moment can elicit so much clarification. How a brief conversation can evoke so much change. How one tiny bump in the road can completely change the course of your entire destination. God doesn’t owe us anything. He doesn’t owe us answers. He doesn’t owe us insight. He doesn’t owe us an explanation. He doesn’t owe us a destination, a map, or even a dropped pin. He is the maker of all creation. He is the one who set the world in motion. He is the one who breathed life into our very lungs. He doesn’t owe us anything. Nada. Nothing. Zilch. But we owe Him everything. We owe Him our heart. We owe Him our ears. We owe Him our hands and our feet. We owe Him our bodies. We owe Him our lives. We owe Him our unwavering allegiance to whatever it is that He has called us to do, scary or not, deep waters or not, unchartered territory or not. We owe Him obedience in the small, mundane things. And we owe Him obedience in the big, out-of-our-comfort-zone things. We owe Him that. So the next time God places something on your heart, the next time God whispers something in your ear, the next time God puts a vision in your head and a dream in your heart: take his hand and FOLLOW HIM. No questions. No rebuttals. No refusals. No buts. Because He’s God. That’s why. Imma be real with y'all, I think pretty much the same three things every single morning. Every. Single. Morning. 3. Did I really see anyone yesterday, or can I wear that outfit again? I am not a morning person. I have never been a morning person. I probably won't ever be a morning person. Creativity pumps through my veins during the night like Gatorade over a college football coach after a big win. So I stay awake late and I suffer the consequences in the morning. Before I can even muster up the courage to respond to my children's demands and whines and needs, I have to stumble into the garage and grab some caffeine. I crave it. I don't feel quite complete without it. Wouldn't it be nice if that's how we felt about Christ? If that's how we felt about diving into the Word every single day: not quite complete without it? If before a single word came out of our mouths, we dove into Scripture. If we stopped expecting for goodness and energy and love to pour out of our hearts when we haven't poured goodness and energy and love into it. If we stopped expecting giving and selflessness and sweetness to spill out of our mouths when we haven't swallowed giving and selflessness and sweetness. If we stopped expecting God to do things for us, when we haven't taken the time to even get to know Him. David was thirsty for God. David was thirsty for His word and His love and His mercy. He didn't just want it, He needed it. He lived for it. Psalms is laced with His yearnings for more of God. Let's retrain our brain. Let's refocus our desires. Let's rewire the inner-workings of our heart's desires to hunger for more of Christ in our days. Before we pour the creamer, before the barista sprays that whipped cream, before we reach for that Diet Dr. Pepper, let's fill our cups with God's truth. Let's long for it like we long for a nap. Let's want it like we want to pee alone. Let's reach for it like we reach for the breadsticks at Olive Garden. Let's crave it like we crave caffeine. "People need more than bread for their life; they must feed on every word of God." Tonight was a bottle moment. Do y'all ever have those? Moments that are so sweet and so pure and so beautiful that you just wish you could capture every tiny particle: the way you felt, the way you loved, the way you breathed in nothing except peace and serenity, the way nothing else mattered and troubles just vanished like pen marks under a magic eraser, and wave your arm and grab it all and whoosh it into a bottle like a good witch casting a spell. Just so you'd have it. And every once in a while, you could nudge it off the shelf, dust it off, open it up, and take a giant whiff. I never want to forget camping out with my little boys on their bedroom floor tonight while they fell asleep, giggling over puppet shows with their beloved stuffed animals, fighting over who loved who the most, and feeling their sweet, little arms wrap tightly around my neck. I never ever ever want to forget, but i will. Tomorrow somebody will spill their cereal, somebody will have a breakdown because i gave them the "Paw Patrol" cup instead of the "Star Wars" cup, somebody will refuse to take a nap, and definitely, most definitely somebody will try to buck the system and require a lengthy time out (and then a second time out when they throw a fit about the first time out). And somebody, I'm not naming names, will need to hide in her messy closet amongst the boxes of scuffed-up Jessica Simpson wedges and folded Lululemon pants, sneak a small glass of red wine, and text an understanding friend to make it through. And without even realizing what's happening, I'll forget all about those sticky little fingers smooshing my face and kissing my nose in a flash. I'll forget and they'll forget, because a magic bottle doesn't exist, and even if it did, there are so many legos and clutter and old junk mail in this house, I'd probably lose it anyways, somewhere with all those single socks and bobby pins. But take heart, momma...because all of these little moments are the foundation on which you are building your family. All of these little moments are the reason your kids will be strong and confident and able. All of these little moments are the reason, they'll still occasionally text you as a teen, lean on you as an adult and trust you to babysit their own precious children one day. All of these little moments are why they will know that they can always come running back to your open arms when they've lost their way, when they've broken a heart, and when they've lost their will to run. You may forget, but they will always leave an impression on your heart like footprints in the sand, and more importantly, on theirs. So breathe in the smell of their Honest shampoo, take a quick picture of their tiny hands holding yours, and stay in their beds cuddled up a little longer than you should. These little moments may fly away like butterflies, but those little wings desperately need them if they are going to have the strength to fly one day. I took a giant step over a navy blue bucket of Star Wars figurines and remote controlled cars, tip-toed through the dreaded scattered land field of Legos, tripped over a plastic baseball bat left over from a birthday party a year ago, and finally caught myself on the "ABC" chalkboard wall, where someone decided to draw all over it with a Expo dry erase marker. Playrooms are no joke, y'all. Books everywhere. Superheroes everywhere. Nerf darts everywhere. CRAP EVERYWHERE. Just crap as far as the eye can see. I walked in, surveyed, exhaled, thought about how much I deserved a treat, calmly exited, closed the door, and walked over to the kitchen island where I began to stress eat my way through a hidden stash of Hershey Kisses I'd saved months ago for a rainy day. Turns out, the playroom gave me anxiety even chocolate couldn't fix. I don't want to sound like a dramatic version of Mariah Carey, but I literally couldn't deal with the disaster my kids had left in that room. It was awful. It was devastating. It was overwhelming. And it was definitely, definitely too much for lil ole me: too much for me to handle, too much for me to clean, too much for me to help. I could've spent hours in that place and never even make so much as a teeny, tiny dent. That's kind of how I feel about Hurricane Harvey. It's just much more. It's much more than I can do, much more than you can do, much more than even J.J. Watt can do. But it's not much more than God can do. Harvey's aftermath was a surprise to you, and to me, and to the weatherman, but it wasn't a surprise to God. He knew that it was coming. He knew what it would do. And before that storm was ever set in motion, before the winds ever began to swirl and before the rains ever began to fall, He knew exactly what we would need to clean that city up. He knew that we would need gumption, and grit and a will to go and grind and give. And most of all, He knew that we would need each other. He knew that we would need to allow race, political affiliation, financial differences and social statuses to fall off and give way to us just being raw and real as human beings. He knew that we would need to emerge from our cocoons and just be butterflies again, so we could fly and flourish and get stuff done. He hasn't called us to do it all, but He has called us to do what we can. He has called us to pick up the Legos on the floor right by our feet. He has called us to help our neighbor pick up the piles of Usborne books and put them back on the shelf where they belong. He has called us to shine where we are, to give what we have, and to be exactly who He's formed us to be from the very beginning. Because that's how a playroom gets cleaned. That's how a city gets rebuilt: little by little, hand in hand, love with love. The world is scary. The news is scary. The problems and troubles and worries we are currently facing as a country are scary. I know. I feel it too. I think it's safe to say that right now, as we watch CNN and scan Fox News, we all feel it like an anchor on our chest. And when things get scary, when things seem out of our control, what does our human nature tell us to do? Where does our human nature tell us to go? Like a child scared of the dark, everything in us yearns to run away, to hide, and to shield ourselves from the potential of pain and hurt and loss. We want to curl up in a ball, throw the covers over our head, and just remain there, silent, still and numb. We want to tiptoe into our parents' room, climb over them until we are tightly secured in the middle of their bed and get lost under the wing of their safe arms. We want to hide in our homes. We want to find security and comfort and peace. We want to hunker down in our basements until the hate and hurt and harm has been wiped away, until the storm has passed and the sun has proven that it is safe to come back outside. And it's true: we probably are safe there in our strong towers. No one can get to us there. No evil can find us there. Bad things can't happen to us when we hide. Nothing can happen to us when we hide. Nothing, and that's the problem. The world might not can reach us, but we can't reach the world either. We can't love from inside our four walls. We can't be light from under the covers. We can't be help from our parents' bed. We can't fight from the comfort of our couches. And the world needs us to fight for it. Our children need us to fight for them. God needs us to fight for Him. He has not called us to be battered, He has called us to be brave. He has not called us to be wounded, He has called us to be warriors. He has not called us to shy away, He has called us to step up. He has beckoned us from up high on trumpets to march fiercely into battle. He has called us to pick up our swords all across this land, and to go out there swinging at all cost. We are His people. His army. His crusaders. We do not flee, we do not hide, we do not surrender. There is no white flag for God's people, because we know who we are fighting for. We know we are fighting to save lives and hearts. We are fighting to save love. Now is the time, Christians to break out the Word and break out of the fragile shells we have built for ourselves. Now is the time to look hate square in the face and shout "BRING IT ON. YOU HAVE NO PLACE HERE. YOU WILL NOT WIN!" 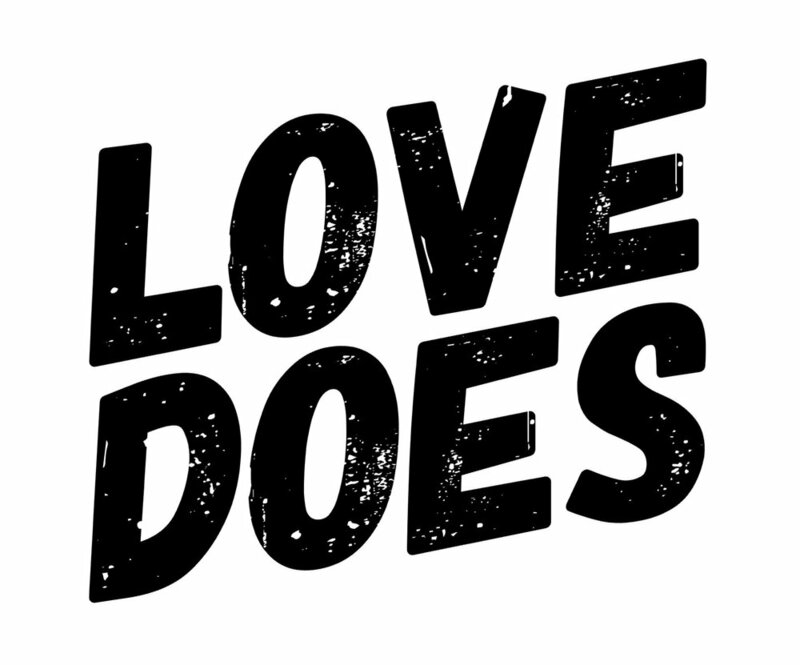 Love does. Love always does. We know this truth. We rest in this truth. We find strength in this truth. So, a couple of friends and I went and grabbed lunch at chic-fil-a a couple of weeks ago. It was delightful. We spent roughly $20 a piece, and our kids ran in and out of the play area barefoot and stinky and begged us for ice cream, to which we responded "not until you finish your nuggets," to which they responded with a whine, and then ran off again like a bolt of crazy energy. One friend had to climb into the play tubes a few times to save her 22-month-old, but it was still worth every penny. Every. Single. One. Even though we were all wearing stretchy workout pants and headbands to hide our greasy hair, the staff still refilled our sweet tea. With a smile. And extra ice. And nobody stared when our kids screamed and squealed and acted like tiny fools. And everyone said "My pleasure," even when they had to sweep the mess of crumbs off the tile floor that our precious tyrants left behind. I just love that place. The only way they could make it better, in my opinion, is to add babysitters, but I won't push too hard for that. I'll leave that one alone. Because, I dunno. Maybe that's a lot to ask of an establishment that sells $6 spicy chicken sandwiches out of paper bags and plastic trays. Maybe. Or maybe I'll write a letter, I don't know. I need to mull that decision over. So anyways, we are eating. And I look at the half-eaten dipping sauces spread out on the table before us. I have chic-fil-a sauce, because, let's be honest, it's the best. Someone else has Polynesian, and someone else has good ole, classic ketchup. And I laughed, because, 1. How could everyone not like the chic-fil-a sauce?!?!? I mean, seriously and 2. It reminded me that everyone is different, and everyone chooses differently, and what everyone needs varies. So I probably shouldn't take it so dadgum personally when someone doesn't like me, when someone doesn't want to be my best friend, when I feel left out or excluded. I mean...I can't do it. I can't be everyone's chic-fil-a sauce. And neither can you. For some people, you are going to be too salty, and for others, you are going to be too sweet. For some, you will be too bold, and for others, you won't have enough flavor. You will be too much and not enough for some people's taste buds to handle and THAT IS OKAY. That is soooo okay. God didn't make you to be loved by everyone. He didn't make you to be one-size-fits-all and generic and boring. He did not send you to this earth so that you could please all the people. He did not create you to be popular or to be invited to all the parties or to be included in every group text. He made you to love Him, and to follow Him, and to carry out His very specific purpose by being your very own distinct flavor. Your flavor won't be for everyone. Take a deep breath and learn to be okay with that. And the next time the devil tries to attack you, or make you stumble over the vicious lie that you are less than, or insecure, or like something is wrong with who you are, because you are feeling rejected, or alone, or unliked, repeat these words. Scream them if you must: I CAN'T BE EVERYONE'S CHIC-FIL-A SAUCE. And then just keep on running the race God has set out before you. Run it hard. Run it good. Run it long. And run it in your very own style.